Sugar is again in the headlines, with SA upping its sugar tax on sweetened beverages, and the sugar industry in some considerable distress. So what’s the global picture? A new report, “Sugar in 2019” by Schroders, the global investment management firm, makes for informed reading. Here’s a synopsis but you can download the full report, free! Finance Minister Tito Mboweni’s announced in his Budget Speech that the Health Promotion Levy (HPL) – aka sugar tax – will be hiked from 2,1 cents to 2,21 cents per gram of sugar per 100ml (with the first four grams of sugar still exempted from taxation) on 1 April 2019, the first anniversary of its implementation. Evidenced by the implementation of the tax – and its increase one year on, Schroders believes that sugar – globally – has become an increasingly important driver of the food and beverage industry and that there are key catalysts that could result in Big Food becoming the next Big Tobacco, potentially resulting in lower sales growth, higher costs and large-scale litigation. Here it takes a look at the risks, how the industry is responding and why investors and the investment industry should be incorporating this risk into investment processes. Increasing awareness of the health effects of sugar is leading to volume and price growth declines across the consumer staples sector, partly as a result of tougher regulations. While soft drinks have shouldered the bulk of this burden, food producers are next in the firing line. Sugar is adding to governments’ increasingly burdensome healthcare bills, thanks to the part it plays in the global prevalence of obesity, diabetes and non-communicable diseases. Governments around the world – now including South Africa – have reacted by introducing sugar taxes, raising revenue and making products more expensive for consumers. Those companies that have already reformulated their ranges or have less exposed portfolios should benefit relative to slower peers. Litigation risk is material. 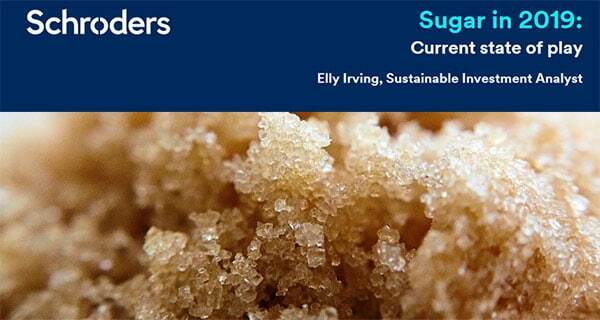 Despite challenges quantifying and attributing the damages caused by sugar consumption, Schroders estimates the impact could be over 1% of the consumer staples sector’s current earnings. Companies with portfolios which are structurally less exposed to sugar are in the strongest positions. Since 2015 Schroders has seen the continued rise of smaller challenger brands creating a wide range of M&A opportunities for the food majors. It has also seen the food majors themselves become a target of activism regarding their commitment to R&D into healthier products. Food and beverage majors are also reformulating existing product portfolios to respond to consumer demand and the threat of sugar taxes. But the results of their efforts have been mixed; reformulation can be costly and can damage the brand if it doesn’t meet consumer expectations. Another response Schroders has seen is an increase in advertising to help offset the move to healthier alternatives. Schroders has seen an improvement in corporate disclosure with greater coverage of the issues around sugar in the last four years. Its proprietary research platform includes over 40 instances of analysts factoring sugar risk into their recommendations, research or company discussions. There are over 50 references to sugar taxes alone. Schroders concludes: “Sugar risk are on the rise. We believe that trends such as the implementation of sugar taxes, regulations regarding advertising and selling practices, and ongoing changes in consumer tastes will continue to create headwinds for the food and beverages sector.